Dmitri Pavlovich, the second child and only son of Grand Duke Paul Alexandrovich and a grandson of Alexander II of Russia, and Alexandra Georgievna, the daughter of King George I of Greece, was born at Ilinskoe near Moscow on 18th September 1891. His mother died soon after childbirth and he was raised by his uncle, Grand Duke Sergei Alexandrovich and the Grand Duchess Elisabeth of Hesse, who had no children of their own. On 17th February 1905, Grand Duke Sergei Alexandrovich was killed when he became a victim of a bomb thrown by revolutionary terrorists led by Boris Savinkov, during the early stages of the 1905 Russian Revolution. The Grand Duchess Elisabeth of Hesse became a nun and Dmitri now went to live with Tsar Nicholas II and Tsarini Alexandra Fyodorovna. It has been argued by Richard Cullen, the author of Rasputin (2010): "Nicholas and Alexandra were very fond of young Dmitri. In fact, some evidence exists that they wanted him to marry their eldest daughter, Olga, and pass on the throne to them jointly, in the likely event Aleksei did not survive childhood." However, the Grand Duchess Olga Nikolaevna, disapproved of Dimitri's behaviour with woman. Cullen goes onto argue: "Dmitri's love of high living and comparatively loose ways very likely shocked the more strait-laced Olga. Dmitri and Olga were first cousins once removed, a connection she may have felt was not healthy for any children they would have together." On 21st November 1916, Vladimir Purishkevich, the leader of the monarchists in the Duma, wrote to Prince Felix Yusupov: "I'm terribly busy working on a plan to eliminate Rasputin. That is simply essential now, since otherwise everything will be finished... You too must take part in it. Dmitri Pavlovich Romanov knows all about it and is helping. It will take place in the middle of December, when Dmitri comes back... Not a word to anyone about what I've written." Yusupov replied: "Many thanks for your mad letter. I could not understand half of it, but I can see that you are preparing for some wild action.... My chief objection is that you have decided upon everything without consulting me... I can see by your letter that you are wildly enthusiastic, and ready to climb up walls... Don't you dare do anything without me, or I shall not come at all!" Eventually, the Grand Duke Dmitri Pavlovich Romanov, joined Felix Yusupov, Vladimir Purishkevich, Dr. Stanislaus de Lazovert and Lieutenant Sergei Mikhailovich Sukhotin, an officer in the Preobrazhensky Regiment,in the conspiracy to kill Grigory Rasputin. Yusupov later admitted in Lost Splendor (1953) that on 29th December, 1916, Rasputin was invited to his home: "The bell rang, announcing the arrival of Dmitrii Pavlovich Romanov and my other friends. I showed them into the dining room and they stood for a little while, silently examining the spot where Rasputin was to meet his end. I took from the ebony cabinet a box containing the poison and laid it on the table. Dr Lazovert put on rubber gloves and ground the cyanide of potassium crystals to powder. Then, lifting the top of each cake, he sprinkled the inside with a dose of poison, which, according to him, was sufficient to kill several men instantly. There was an impressive silence. We all followed the doctor's movements with emotion. There remained the glasses into which cyanide was to be poured. It was decided to do this at the last moment so that the poison should not evaporate and lose its potency. We had to give the impression of having just finished supper for I had warned Rasputin that when we had guests we took our meals in the basement and that I sometimes stayed there alone to read or work while my friends went upstairs to smoke in my study." 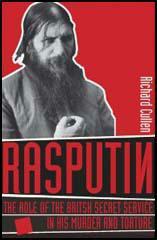 Rasputin's body was found on 19th December by a river policeman who was walking on the ice. He noticed a fur coat trapped beneath, approximately 65 metres from the bridge. The ice was cut open and Rasputin's frozen body discovered. The post mortem was held the following day. Major-General Popel carried out the investigation of the murder. By this time Dr. Stanislaus de Lazovert and Lieutenant Sergei Mikhailovich Sukhotin had fled from the city. He did interview Dmitri Pavlovich Romanov, Felix Yusupov and Vladimir Purishkevich, but he decided not to charge them with murder. Dmitri Pavlovich was sent to the Persian Front and was out of the country during the Russian Revolution. Pavlovich wrote to Prince Felix Yusupov: "Yes! It (the Revolution) has happened! The development of events, the possibility of which you and I had visualised, has come to pass. The final catastrophe has been brought about by the wilful and short-sighted obstinacy of a woman (Alexandra). It has, naturally, swept away Tsarskoe and all of us at one stroke, for now the very name of Romanov is a synonym for every kind of filth and indecency. I regard the future gloomily, and if I had not firm faith in God's mercy, and were not convinced that everything comes to an end that better days must dawn at last - I should most likely have lost courage long ago!" Pavlovich managed to escape London where he joined up with fellow conspirator, Prince Felix Yusupov. The two men fell out over Yusupov's decision to speak openly about the killing of Grigory Rasputin. He moved to Paris where he had a brief affair with Coco Chanel. 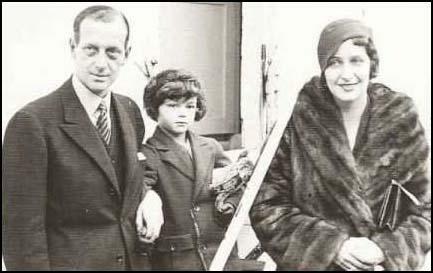 Dmitri Pavlovich with his son and wife. In 1927 Pavlovich married an American heiress, Audrey Emery. The following year they had a son, Prince Paul Romanovsky-Ilyinsky. The couple were divorced in 1938 and Audrey took her son to live in the United States. Pavlovich was active in the pro-fascist Union of Mladorossi. However, it has been argued that he rejected a suggestion by Adolf Hitler to lead exiled Russian soldiers within the German Army as part of Operation Barbarossa. The reason for this was probably for health as much as political reasons. Dmitri Pavlovich died from kidney failure in Davos, Switzerland, 5th March, 1941. On the night from the sixteenth to the seventeenth the point duty policeman heard several shots near 94 Moika, owned by Prince Yusupov. Soon after that the policeman was invited to the study of the young Prince Yusupov, where the prince and a stranger who called himself Purishkevich were present. The latter said: "I am, Purishkevich. Rasputin has perished. If you love the Tsar and fatherland you will keep silent." The policeman reported this to his superiors. The investigation conducted this morning established that one of Yusupov''s guests had fired a shot in the small garden adjacent to No. 94 at around 3 a.m. The garden has a direct entrance to the prince's study. A human scream was heard and following that a sound of a car being driven away. The person who had fired the shot was wearing a military field uniform. Traces of blood have been found on the snow in the small garden in the course of close examination. When questioned by the governor of the city, the young prince stated that he had had a party that night, but that Rasputin was not there, and that Grand Duke Dmitrii Pavlovich had shot a watchdog. The dog's body was found buried in the snow. The investigation conducted at Rasputin's residence at 64 Gorokhovava Street established that at 10 p.m. on 16 December Rasputin said that he was not going to go out any more that night and was going to sleep. He let off his security and the car in his normal fashion. Questioning the servants and the yard keeper allowed police to establish that at 12:30 a.m, a large canvas-top car with driver and a stranger in it arrived at the house. 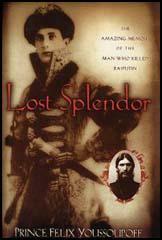 The stranger entered Rasputin's apartment through the back door. It seemed that Rasputin was expecting him because he greeted him as somebody he knew and soon went outside with him through the same entrance. Rasputin got into the car, which drove of along Gorokhovava Street towards Morskava Street. Rasputin has not returned home and has not been found despite the deployed measures. Yes! It (the Revolution) has happened! The development of events, the possibility of which you and I had visualised, has come to pass. The final catastrophe has been brought about by the wilful and short-sighted obstinacy of a woman (Alexandra). It has, naturally, swept away Tsarskoe and all of us at one stroke, for now the very name of Romanov is a synonym for every kind of filth and indecency. I regard the future gloomily, and if I had not firm faith in God's mercy, and were not convinced that everything comes to an end that better days must dawn at last - I should most likely have lost courage long ago! Ah, how desperately I long at times to have a talk with you! How intensely I long to share my thoughts and opinions with you! We have lived through so much together; it is not often that people meet under such strange conditions. You used to understand me so well; you knew how to support me in moments of trial. For God's sake write to me. What is happening? How are things? In finishing this letter, my dear friend, I might even say without fear of exaggeration, my dearest friend, I wish to assure you my sincerest affection. My thoughts often and often fly to you in an eager but impotent desire to help you, or only to be with you. Kiss your wife for me. She will know me better by now from your descriptions of me. I send my love to your parents. Tell your mother that I frequently think of her. God keep you, my dear friend. Keep up your spirits. I am as yet far from losing courage. For God's sake, write to me as much as you possibly can, and with as many details as you can get in. If you disagree with me, say so outright, we shall understand each other.